Mundelein, Illinois, is an outer suburb about 35 miles northwest of downtown Chicago. This diverse, well-educated, community-minded village of just more than 30,000 people is known for St. Mary of the Lake Seminary. 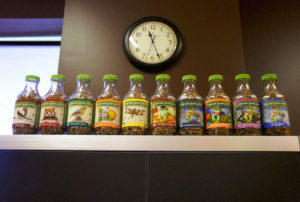 Okay, maybe Mundelein isn’t quite yet famous for kombucha, a fermented tea with healthy probiotic properties that in recent years has drawn a growing consumer base, in part as an alternative to sugary soft drinks. But if hard work and passion are the keys to entrepreneurial success, then Susan Fink’s Karma Kombucha is going to turn Mundelein into a kombucha capital. 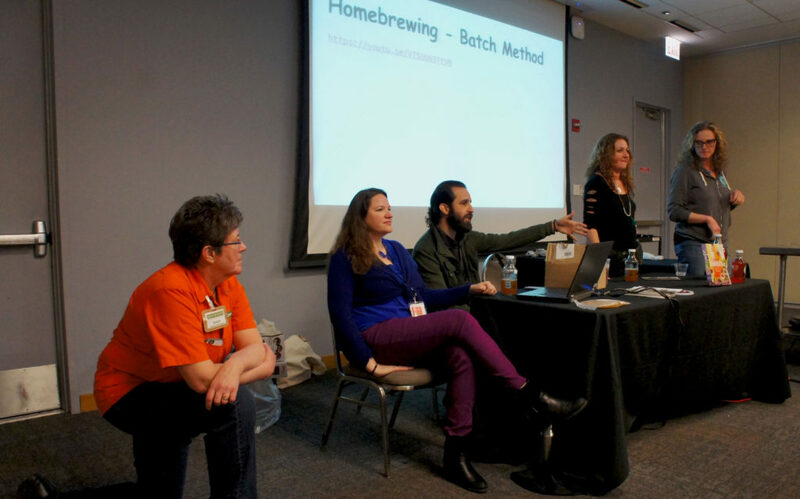 What began as a home-brewing hobby grew into a second career that has taken the several flavor varieties of Karma Kombucha into Chicago-area stores of major chains such as Whole Foods Market and Mariano’s, and Fink into the current cohort of FamilyFarmed’s Good Food Business Accelerator program. Susan Fink has built Karma Kombucha into a growing business over five years as the sole proprietor and only full-time employee. Now, with palettes of bottles taller than she is, Fink is raising financing to hire people to work with her. Photo by Bob Benenson/FamilyFarmed. Fink applied to participate in the Accelerator because she wants to grow Karma Kombucha, and one of her needs is modest outside financing — in the range of $150,000 — so she can hire employees. Note, there, that it does not say “new employees.” While many entrepreneurial startups are known as “mom and pop” businesses, Karma Kombucha is all mom. Fink has built the business to this point as the sole employee, with assistance from her wife, Michele Dziaba — a packaging engineer who, like Fink, worked for many years at Kraft Foods — on matters such as bottling and representing Karma at public events. Fink’s participation in the Good Food Business Accelerator already has had one major unanticipated benefit. An article on the front page of the Chicago Tribune’s business section, published March 27, featured Fink and other Accelerator Fellows who pitched to investors three days earlier at the Good Food Financing & Innovation Conference, the first day of FamilyFarmed’s three-day, 12th annual Good Food Festival & Conference. 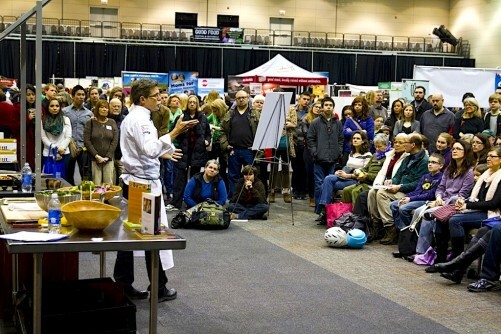 Along with Fink’s pitch, Karma Kombucha provided samples of its products at the Good Food Financing Fair, Trade Show and Festival; and Fink took part in a workshop on home-brewing kombucha along with Alla Shapiro and Vanessa Tortolano of NessAlla Kombucha (based in Madison, Wisconsin), and Hannah Crum and Alex LaGory, the married owners of the Kombucha Kamp website and authors of The Big Book of Kombucha. 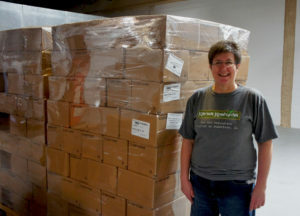 Susan Fink of Karma Kombucha did some serious multitasking at FamilyFarmed’s Good Food Festival & Conference in March. She pitched to investors; poured samples of Karma with wife Michele Dziaba; and participated in a home-brewing workshop. Photos by Bob Benenson/FamilyFarmed. Karma Kombucha certainly fits well within FamilyFarmed’s definition of Good Food. 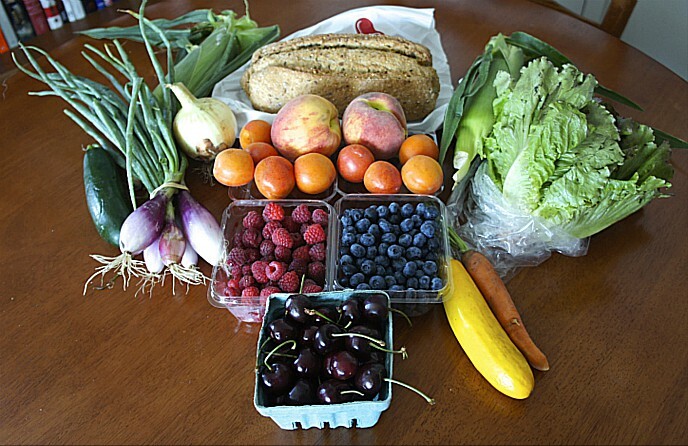 It is local, and with its USDA organic certification, is it sustainably produced. Karma Kombucha produces kombucha in five standard varieties: Origins, Mixed Berry, Masala Chai, Ginger Orange and Pineapple Passion. Other flavors are rotated in and out of the product lineup. The amount of sugar is minimal compared to that in most commercial soft drinks, and the flavors are created by adding organic fruits and botanicals to the brewed tea base rather than juices. 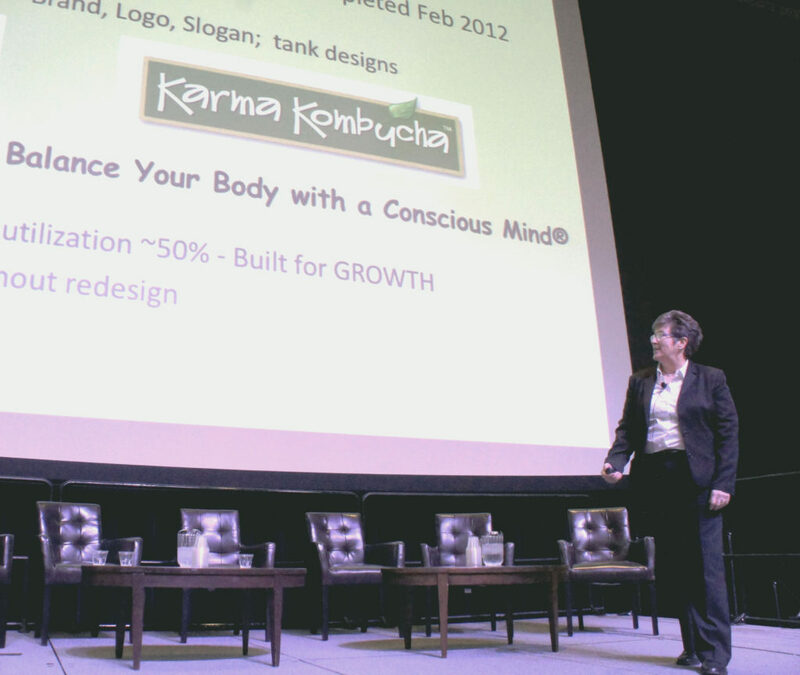 Fink first learned about kombucha during her 26-year career in product development with Kraft Foods. She said her product innovation group surveyed her fellow baby boomers about their food priorities. “One of the things we heard repeatedly from people is ‘detox me,’” she said. She subsequently started looking into the reputed health benefits of kombucha. She disliked some of the early commercial products she tasted — “It was a funky aroma, it was way too carbonated” — so she experimented with home brewing, and “it started coming out better and better and better.” She also perceived that the live cultures in the drink were helping boost her immune system. 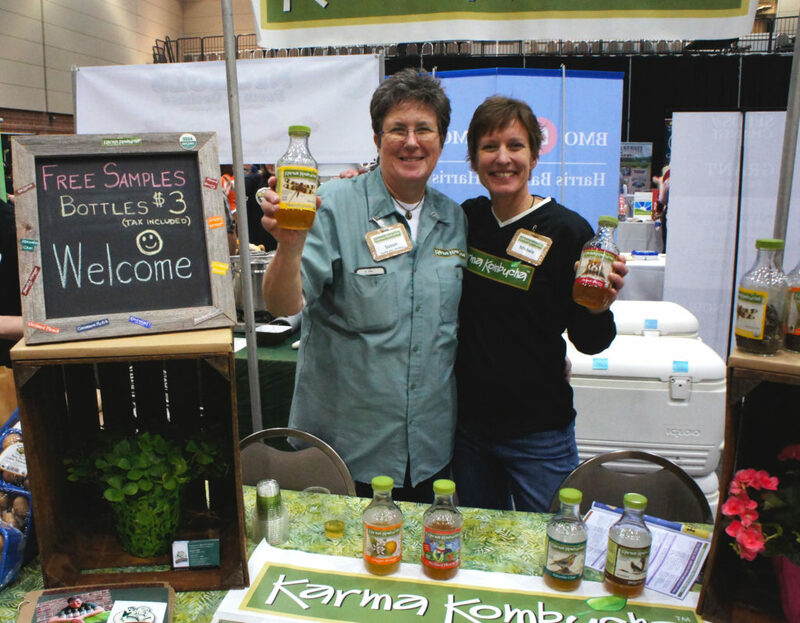 Karma Kombucha (and Conscious Mind Products LLC, its corporate identity) came about after Fink’s job at Kraft was swept away in 2010 by the Great Recession. “I lost my job, and it came down to a decision, do I go back to corporate America or do I start this? 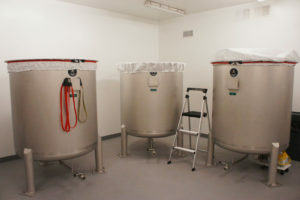 So I threw caution to the wind, and a lot of money to the wind, and here we are,” Fink said during an April 15 interview and tour of the brewery. Fink, who had a long first career in the corporate food industry, bought a new brew kettles and fermenters to produce her Karma Kombucha. Photo by Bob Benenson/FamilyFarmed. Starting over also included new heaters, HVAC, lighting, paint, loading dock doors and, according to Fink, “We had to dig through 50-year-old concrete to put in a sanitary sewer line.” While her brewing and fermenting equipment is all custom-made, she saved money by McGyvering a lot of used items. The chain link locked chemical storage area, which meets government regulatory standards, was once a dog run. The product storage cooler was once a meat locker. The product laboratory has tables formerly used in a school science lab. The kombucha brewing process starts out with something very basic: brewing tea, with different types of tea used to achieve the desired flavors. What gives kombucha its unique sweet-tart profile, and its probiotic qualities, is the SCOBY, an acronym for “symbiotic colony of bacteria and yeast.” Though a SCOBY can take on a bit of a science-fiction appearance, its contribution to fermentation is similar to that of a sourdough starter or the “mother” used in producing vinegar. 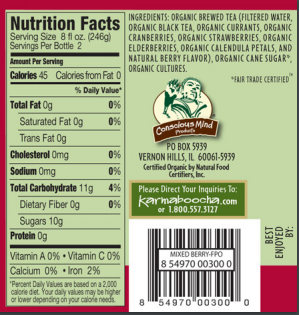 The label of Karma Kombucha’s Mixed Berry illustrates the producer’s reliance on raw, organic ingredients and the relatively small amount of sugar. This entry was posted in Craft beverages, Financing, Food and health, Food Artisans, Food Entrepreneurs, Functional foods, Good Food and economic development, Good Food Business Accelerator, Good Food business development, Good Food Festivals, Good Food Financing Fair, Good Food marketing, Sugar, Sustainable food retailing and tagged FamilyFarmed, food and health, Food Entrepreneurs, Good Food Business Accelerator, Good Food Festival, Good Food Festival & Conference, Good Food Financing Fair, health properties of kombucha, Karma Kombucha, kombucha, kombucha entrepreneurs, probiotic foods. Bookmark the permalink.